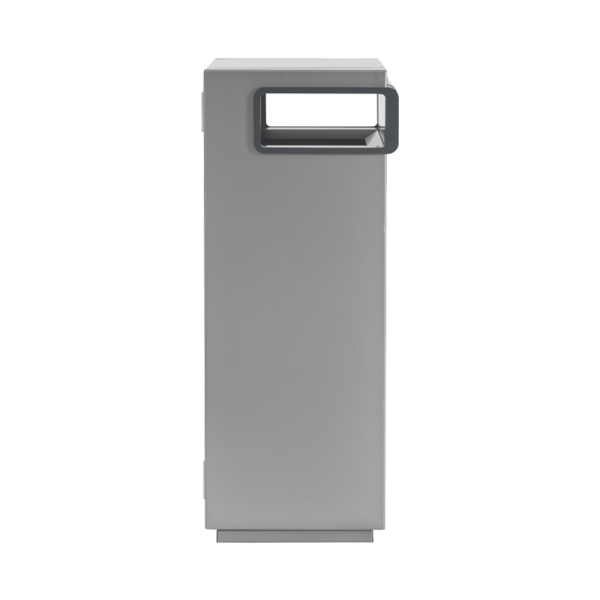 A stylish and sturdy waste bin in grey powder-coated steel, which can stand alone or as part of a module within a recycling station, and is suitable for a range of environments, outdoor and indoor. Extra surface treatment must be ordered if it is to be used outdoors. The coating is anti-graffiti, which means that it is possible to remove graffiti without damaging the coating. It is also possible to order the Nobel as a stand alone unit with ashtray and lid-mounted stub disc. The aperture is intuitively designed and the standard coating option is dark grey. Alternative RAL colours can be ordered for both the body and aperture, for a small surcharge. The bin takes up little space and can hold a high volume of waste. It is easy to empty and install. The waste bin has an internal, removable liner holder for a standard 100 litre plastic liner. The door has a sturdy lock which uses a four-sided key, or a twist lock can be used.